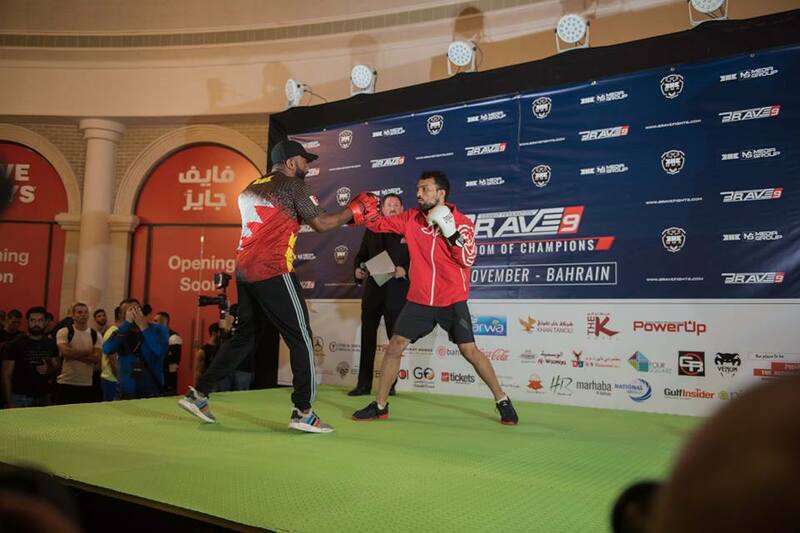 The fight week for Brave 9: The Kingdom of Champions has kicked off with a bang as 16 fighters showed their skills in front of a packed The Avenues Shopping, in Manama, Bahrain, in the biggest-ever Open Workouts in promotional history. Main card fighters Ottman Azaitar, Alejandro Martínez, Elias Boudegzdame, Lucas Mineiro, Gurdarshan Mangat, Stephen Loman, Jarrah Al Selawe, Carl Booth, Gesias Cavalcante, Alan Omer, Erick “Índio Brabo”, Abdul-Kareem Al-Selwady, Mohammad Fakhreddine and Tahar Hadbi all took the stage to put on a display of their skills. In addition, Bahrain’s one and only Hamza Al Kooheji treated his local fans with a stage appearance. The day also saw the first stare-downs ahead of fight night, on November 17th! Present on scene was His Highness Sheikh Khaled bin Hamad Al Khalifa, who wished good luck to all athletes involved, and Illir Latifi, Brave 9’s guest UFC fighter. Things got heated at the face-off’s, specifically with Jarrah Al Selawi and Carl Booth. Watch the altercations here! Curiously, Alan Omer was involved in another infamous moment during his workout. The German Lightweight as hitting pads, when a combination of punched and kicks sent his trainer flying away from the stage. After confirming he was OK, Omer laughed the incident off. Finally, all six fighters involved in the three title bouts received a big welcome from the crowd as they showed off some of the moves that got them to where they are. Featherweight challenger Lucas Mineiro and champion Elias Boudegzdame, alongside Lightweights contenders Alejandro “Pato” Martínez and Ottman Azaitar, and Bantamweight title hopefuls Gurdarshan Mangat and Stephen Loman also faced off with their opponents for the first time in three tense staredowns. Brave 9: The Kingdom of Champions marks the promotion’s return to Bahrain after a year. During 2017, the organization has put on groundbreaking events in countries such as Brazil (twice), Mexico, the United Arab Emirates, India, and Kazakhstan. Brave 9 will be the culmination of the International Combat Week, alongside the IMMAF World Championships, under the patronage of His Highness Sheikh Nasser bin Hamad Al Khalifa.